Our parking barriers provide safe and reliable access to underground garages, parking areas and works entrances and allow authorized persons to enter in a matter of seconds. There are two different parking barrier concepts available to cater for the width, height and accessibility of the entrance. The Parc 200 parking barrier system works on the basis of Marantec direct current technology, and so guarantees outstanding user-friendliness and safety features: Soft starts and soft stops that optimally relieve the gears and the barrier arm and guarantee extremely quiet operation. For maximum flexibility, the parking barrier can be installed on the left-hand or right-hand side. The steel housing is extremely sturdy and weather-resistant. A retrofittable fire department unlock can be integrated for emergencies. The Parc 300 parking barrier system works on the basis of Marantec direct current technology. Parc 300 incorporates reinforced gears which give it the necessary strength to lift large barrier arms. The spring assemblies are exchangeable, which is ideal for maintenance purposes and for ensuring the durability of the overall system. This is supported by the equally proven Marantec reference point technology. 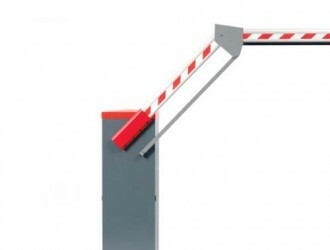 The system operates one-piece barrier arms up to 6 metres, and automates entries spanning up to 12 metres in the case of double barriers. Opening times are between 8 and 15 seconds. A total of about 750 to 1,000 movement cycles are possible per day. Through the variable left-hand or right-hand fitting feature offered by only one housing, Parc 300 is prepared for every installation.